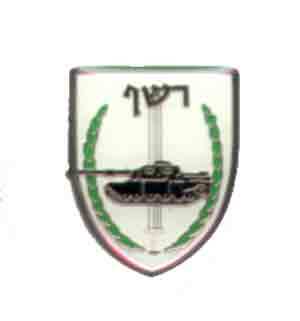 IDF Israel Army Reshef Unit Tag. The Israeli Armor Corps is a corps of the Israel Defense Forces. The Israeli Armor Corps is a corps of the Israel Defense Forces, since 1998 subordinate to GOC Army Headquarters. The Armor Corps is the principal maneuvering corps, and primarily bases its strength on Main Battle Tanks. The Armor Corps is the decisive corps in GOC Army Headquarters, and bases its "crushing power" on its "fists of steel": a combination of mobility, armor, and firepower. During wars, its role is, on the one hand, to lead the first line of the attacking forces and to clear the area of the enemy, while on the other hand, to block the armor forces of the enemy and to destroy its tanks and armor. During peacetime, it reinforces the Infantry Corps while it performs security tasks, with the tanks serving as a mobile bunker. The formidable might of the Israeli armed forces is expressed in the many tags and insignias available for sale on Dokomedia's page here at Amazon, along with many other items of interest to those interested in these collectibles. As much as Israel's military might has been necessary in the past and even in the present to protect the Jewish people living in their ancient homeland, the reality of today's world shows us that ultimately it is the human soul which carries the real answer to peace. With this thought in mind, one does well to remember the tremendous sanctity of life in Jewish tradition, and one can pray that these values will always accompany the pilots of the Israeli air force, such that the Jewish people will indeed merit divine protection in times of trouble.